Lived c. 1170 – c. 1245. Fibonacci was the greatest Western mathematician of the Middle Ages. In the absence of his contributions, the scientific revolution started by Nicolaus Copernicus in 1543 would not have been possible. Fibonacci introduced the modern number system to the West, which ultimately allowed science and mathematics to flourish. His father’s name was Guglielmo Bonacci, a public official concerned with taxation of trade between Pisa and North Africa. Fibonacci’s father spent a lot of time in the Arab port city of Bugia (now in Algeria). His work in taxation of trade led him to believe the future would be bright for people who understood numbers thoroughly. He had his son schooled in mathematics for a short time in Bugia. The young Fibonacci was fascinated when he learned that Arab mathematicians did not use the Roman system of numbers: I, II, III, IV, V, etc, used in Europe for over a thousand years. Western mathematics had in fact declined into deep hibernation after the fall of Ancient Greece. And although Ancient Greek mathematics had been stunningly brilliant – particularly in geometry, it was far from fully developed. It was severely hampered by the Greek number system, where numbers were represented by letters of the alphabet. To see the awkwardness of this system, think about calculating 17 × 19; it’s easy to do using modern numbers. Imagine, though, trying to multiply Q × S (the 17th and 19th letters of the alphabet). Suddenly what’s easy becomes awkward. In the Roman system 17 × 19 would be XVII × XIX. The clumsy notation and the lack of the place value concept of ones, tens, hundreds, thousands, etc, made life as difficult for Roman mathematicians as it had been for Greeks. In addition to their unwieldy numbers, Ancient Greeks and Romans also lacked the number zero; this made arithmetic and mathematics awkward, and would have made the development of modern mathematics impossible. 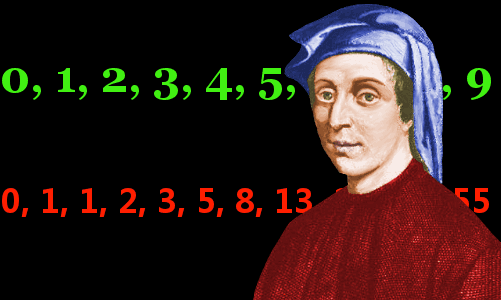 Fibonacci immersed himself in the new number system he learned in Bugia, realizing it was a huge improvement on Roman numerals. In addition to what he learned in Bugia, Fibonacci later traveled around the Mediterranean to Egypt, Greece, Sicily, Southern France, and Syria, learning more mathematics. Most recognizable to western eyes are the Hindi symbols for zero, two and three. The properties of the number zero were defined in Indian mathematics by Brahmagupta. From India the new numbers traveled west to Persia, then to the Middle East and North Africa, and then, as we’ll see, to Europe. As the numbers moved westward, their shapes changed somewhat. In Europe people called the new numbers Arabic numbers. Today the system is most often called the Hindu-Arabic number system. The new number system spread westward. Fibonacci believed the Indian number system had huge advantages over the Roman system and believed the people of Europe should adopt it. In 1202 he published Liber Abaci – the Book of Calculation – which began the spread of the modern number system in the West. Fibonacci updated the book and published a new edition in 1228. His Book of Calculation showed how calculations in commerce, finance, and pure mathematics could be carried out with the new number system. How Important was Fibonacci’s Book? The fall of Constantinople resulted in its refugees arriving in Italy. Some of the refugees brought with them Ancient Greek texts that had been locked away for many centuries in Constantinople. These Greek texts helped trigger the Renaissance in Italy. An illustration from Gregor Reisch’s 1503 work Margarita Philosophica. 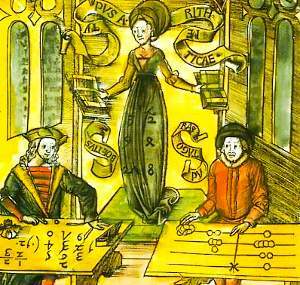 The man on the left working with the new number system is happy, while the other (Pythagoras), using a counting board, is sad. In the center the female Arithmetica wears a dress emblazoned with the new numbers. Fibonacci’s Book of Calculation was also important for European commerce and finance. In Arab lands the new number system had been used only by mathematicians and scientists. Fibonacci saw the superiority of the new system for businesses and devoted several chapters of his book to show calculations of profit, interest, and currency conversions. In fact, the book’s immediate impact on the commercial world was much greater than on the scientific world. Some of the topics Fibonacci considered in his book were: the new numbers; multiplication and addition; subtraction; division; fractions; rules for money; accounting; quadratic and cube roots; quadratic equations; binomials; proportion; rules of algebra; checking calculations by casting out nines; progressions; and applied algebra. The algebra in the Book of Calculation was principally influenced by work published by the mathematicians Al-Khwarizmi from Persia; Abu-Kamil from Egypt; and Al-Karaji from Baghdad. Fibonacci also famously considered the rabbit problem, which gave rise to the Fibonacci Sequence. A man places a pair of rabbits into a garden surrounded by a wall. How many pairs of rabbits can be produced in a year if every month each pair produces a new pair which from the second month on becomes productive? This remarkable sequence, which was already known in Indian mathematics, occurs repeatedly in mathematics and also in the natural world, where, for example, the scales of pine cones run in spirals arranged in ratios determined by the Fibonacci Sequence. Even in art the Fibonacci Sequence is prominent. If you divide one term in the sequence by the previous term, the result gets closer and closer to the golden ratio – loved by artists and architects – as the terms get larger. Fibonacci did not merely copy the works of the Greeks, Indians, and Arabs. He was a brilliant mathematician in his own right. His fame spread to Frederick II, the Holy Roman emperor, whose own mathematicians were unable to solve a number of problems, so he challenged Fibonacci. Fibonacci published his solutions to the challenges in his 1225 book Flos (Flower). The plus (+) and minus (-) signs introduced by the German mathematician Johannes Widmann in 1489. The equals sign (=) introduced by the Welsh mathematician Robert Recorde in 1557. The multiplication sign (x) introduced by the English mathematician William Oughtred in 1631. In 1223: Practica Geometriae (Practical Geometry) – a mixture of pure mathematics, theorems, proofs, and practical applications of geometry, such as using similar triangles to calculate the heights of tall objects. Before 1225: Epistola and Magistrum Theodorum (A Letter to Master Theodore) – a letter to Frederick II’s philosopher Theodorus Physicus solving three problems in mathematics. In 1225: Liber Quadratorum (The Book of Squares) – A highly mathematical number theory book dealing with solutions to Diophantine equations – in this work we see just how accomplished a mathematician Fibonacci truly was. Little is known about the end of Fibonacci’s life. We know he was alive in 1240, because his achievements were recognized by his home city of Pisa, which granted him a salary for his work. He would have been about 70 years old at this time. "Fibonacci." Famous Scientists. famousscientists.org. 10 Sep. 2015. Web.